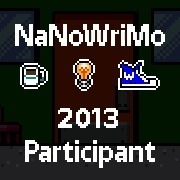 You may have noticed that at the top of this very website, there is in fact a new menu option for NaNoWriMo (which I will be calling NaNo for short) where I have put an initial post about my intention to take part in this years NaNo. I am hoping to add some pages under the NaNoWriMo menu option at the top, which will allow me to update my progress along the way. 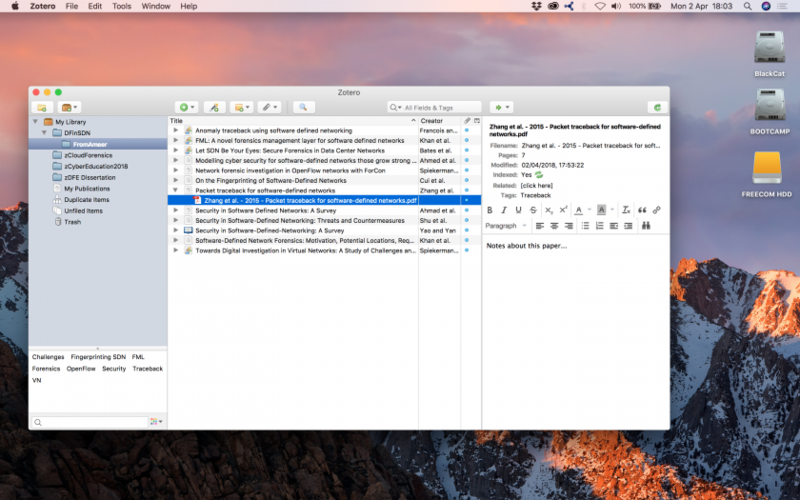 There is also the NaNo word count tracker, which I have set up in the side bar of the website (it is included in the main NaNo page as well) which will automatically update when I sync my word count on NaNoWriMo.org. There is a week, well as I type this, 6 days, in which anyone participating has left to plan their novel (if they so wish – some people start on the 1st of November without having planned and just start typing/writing). I have got to do some planning now that I have finally got my NaNo kit sorted. What is this kit that I am referring to? Well, for portability I am going to be using my iPad, as my netbook keeps over heating and my laptop is far too heavy to lug around, and is equally not so reliable. I have bought Pages from the App Store and have today acquired a bluetooth keyboard so I can easily type and see what I am typing and don’t have to use the on screen keyboard which would make typing a 50,000 word novel quite tough I think! I really like the keyboard I went for, it is the Logitech k810 Bluetooth Illuminated Keyboard (or wireless keyboard as some websites call it). It was more than the official Apple keyboard but it is fairly similar in design but can easily be switched between 3 devices (once paired with them – which is a simple as pushing the connect button on the bottom of the keyboard and selecting the device from my iPad’s Bluetooth settings menu. I will also be able to use it with my iPhone if I wish and my PC (which will be great as my current wireless keyboard and mouse will not last terribly much longer I fear as the receiver seems to frequently be pulled about and It will no doubt start getting a loose connection in the receiver part before too long, I have had it a good number of years now so its done a great job, only had to replace the mouse as I dropped something onto my desk accidentally and it hit the mouse and the mouse went flying and the left mouse button no longer clicked!). So technology kit wise, I should be all set for NaNo. The rest of my NaNo kit has not quite fully been gathered yet. I have started jotting some things down in my A5 Pantone notebook, but I think things like character notes and chapter details etc. 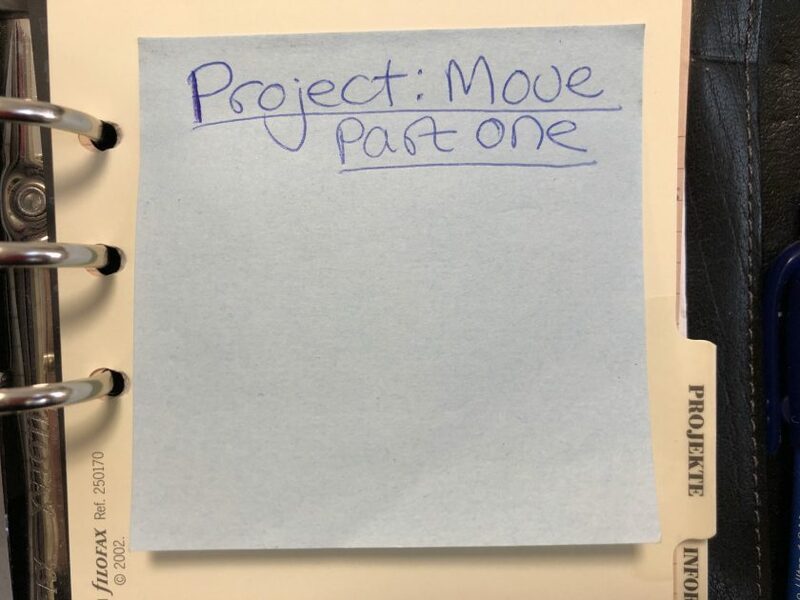 would be better on loose leaf paper so it can be moved around and added to, extra pages inserted and the like so I need to put together a Filofax (or similar ring binder) so I can start sorting that out ASAP. The only problem with this is that I don’t quite know what to use! The main issue really is the size – how big do I want/need this binder to be? Will I have enough space if I use a Pocket sized Filofax, should I just go for A5 sized paper and binder or will I need A4 paper and in which case I will need to locate either one of the 4 ring binders or leaver arch folders I have (although I think the leaver arch option might be a bit too big…). I could also really do with being able to easily obtain the paper to use for this – ideally it should be blue as I find it much easier to read from – and it should also not have to involve too much faffing around with the trimmer and hole punch, if any at all. For this reason, A5 and A4 are quite frankly the easiest options here, as I have a ream of A5 sky blue paper and a ream of A4 sky blue paper – neither are lined but I can easily sort that as I have a printer. If I ignore the blue paper, I have an Oxford pad that comes hole punched and will fit in an A5 Filofax or other A5 ring binder, so no having to use the trimmer or hole punch! I really wish there were more notepads available with coloured paper pages as there are enough people in the UK that are Dyslexic and/or have Irlen Syndrome, let alone just those that prefer to work on coloured paper!!! 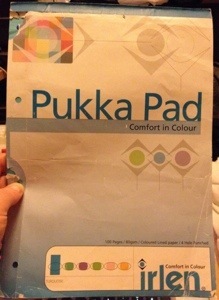 Which leads me on to my other A4 choice – a Pukka Pad of “turquoise” lined and 4 hole punched refill paper. It’s called turquoise but I wouldn’t have ever called it that if I was labelling it! It’s definitely blue, not quite just blue, definitely not the sky blue I would prefer but it is better than white without question! They do pads in other colours (Green, Lavender, Parrot, Rose and Gold) but the colour I find best is blue, but I would also try the Rose as its really the only pastel shade the others are quite bold. So once I have sorted out the paper issue, there is the next, small, issue of which binder! I have a few A5 Filofax options, I would love to use a Pocket sized Filofax as I have a lovely little purple Finchley that needs to be put to use, or a Pink Opal, Wine Holborn or even my Crimson Malden, I equally have a selection of Personal sized Filofax that could do with being utilised… but my A5 ones are sort of already being used, so I would need to take stuff out and switch it up for November, which is totally do able, but makes it a puzzle! I feel like I would be better using one of the A5’s as they are large enough to write in easily and not as big and cumbersome as an A4 would be (when I’m trying to carry as little around with me as possible so I don’t cause my shoulder any more grief!). It would be great to be able to fit it in a Pocket sized one though, really small and pretty too! 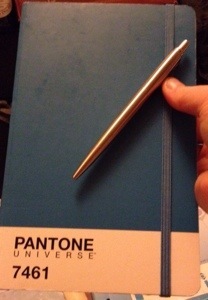 I will be using my Pilot 0.5 Vballs to write with as they just flow, although I have attached the clip of my Parker Jotter biro to my Pantone notebook at present, the paper of that is light blue incidentally! I will also probably use a pencil and some colours to highlight things or mark them so they are clearly all about the same topic/part of the plot/character. 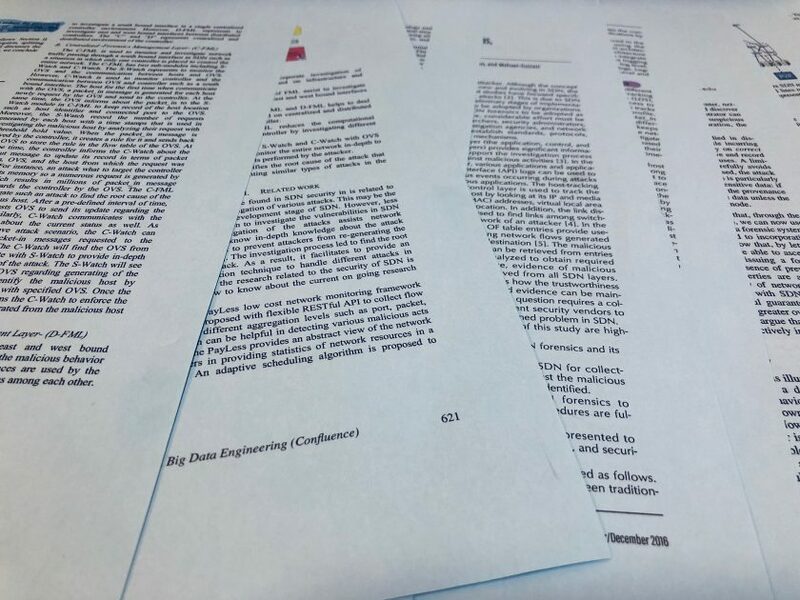 When I have made my decisions about the size and paper I can then get to the real bones of the planning. I think I know what I am going to be writing about but it needs to be planned out so I can see if there is enough of a story. I may have to rethink things if it seems there isn’t enough to write about, in which case I will need to come up with a new story very quickly or I will run out of time! I am not at work for the next two weeks after my shift on Saturday, although I have Jury Service, but I aim to write as much as I can during any periods of time when we are just sitting around waiting (which, if my previous Jury Service is anything to go by, will be most of the time – and yes I have been selected twice now!!!). This is why it was so important that I had a Bluetooth keyboard to use with my iPad, and time frame wise, it had to be now. That’s all from me for now, I was only supposed to be typing a bit of an update to try out my new keyboard, so I have now done that and written an essay, which I don’t think is massively well written – I know I have been just following my “off at several tangents” thoughts so apologies if I lost most of you on the way, well done if you have managed to either make it or skip to read this bit! So for now, I need some beauty sleep before my shift at work, which includes a kids Halloween party – that I have to dress up for and be somewhat alert! Should be interesting! If you are taking part in NaNo or have any suggestions for me about the rest of my kit, especially if you think there is anything I have missed out that will be vitally important, please let me know in the comments section below!